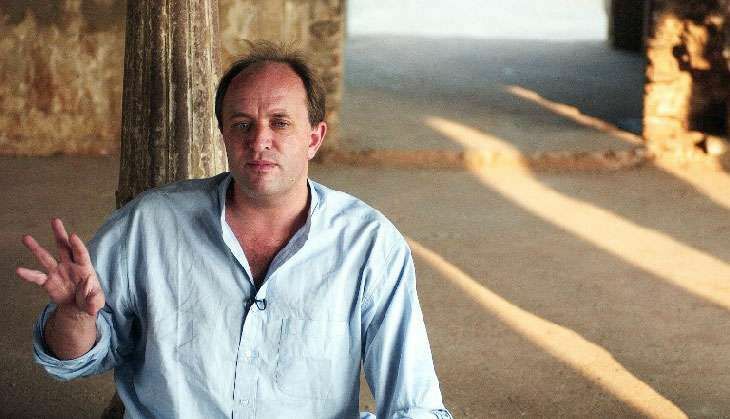 Writer-historian William Dalrymple is giving interviews for his newest book Kohinoor: The Story of the World's Most Infamous Diamond (Juggernaut Books). A book that he has co-authored with Anita Anand, a British radio and television journalist and author of Sophia: Princess, Suffragette, Revolutionary. Dalrymple is giving his third interview of the day. The venue is Bikaner House. He stares at his empty mug on the table, before requesting for another cup of coffee. What he perhaps doesn't know is that the canteen staff is now busy attending to a VVIP. Rajasthan Chief Minister Vasundhara Raje is here for a meeting, and his coffee will have to wait. He starts talking about the Kohinoor diamond - a story that should have ideally been told long, long ago by an Indian historian - and how he took a six-month break, from a bigger book he is currently working on, to write this up. He tells Catch what it took to rid the most famous diamond of the world from "the fog of mythology", why Kohinoor is also the most "infamous", as the title of the book suggests, diamond in the world, and why it was never the biggest in the world ever. He talks about the great curse of the diamond - laughingly suggesting that "if a polity survives the great curse of the diamond it can survive anything". He is "99 percent" certain that the Kohinoor - the object of desire, the powerful symbol of sovereignty, the mythical gem - whichever way you look at it, originated in India, even though there are several countries laying claim to it now. "Even the Taliban!" he chuckles. By now he seems to have forgotten about his coffee. Just as well, because it will not be served -- at least not till I say bye to him. "Willy here. Can I get some coffee, please?" I hear him say as I walk out. WD: ...May have slipped below the 100th mark (chuckles). LH: So why do we regard it as the greatest gem in the world? WD: It is not the greatest gem in the world in terms of its physical presence, but it has history, rich and bloody. The truth that this book shows is that the Kohinoor turned into the rockstar of the gem world in 1851. The Mughals loved gems, especially rubies and spinels, which were not even used much, and they put the best diamonds and the best rubies on the peacock throne - a reflection of the throne of paradise... No diamond was as luxurious as the Kohinoor. At the Great Exhibition of 1851 in Britain, when 3 million people queued up to see it, it became a symbol of Imperial triumph. It was on the front pages of newspapers, and that is the moment when it became an icon. LH:You write that those who saw the Kohinoor were not impressed by its size. LH:In the title of your book you call it 'infamous'. Why? WD: Whether or not you believe in the curse or not, many of the owners came to be cursed. Nader Shah was assassinated, Ahmed Shah's face was eaten up by maggots, Nader Shah ordered that his son Reza be blinded, a jug of molten lead was poured over Nader Shah's grandson's head, five of Ranjeet Singh's successors were murdered, assassinated, poisoned, clubbed to death..
And when the ship taking it to England sails over the sea cholera breaks out and the whole crew is affected (laughs). So objectively speaking it has this divisive and bloody past. And to this day, there are five countries claiming it - Afghanistan, Pakistan, Iran, India and the Taliban (laughs). LH:So why do you think some of us Indians want it back? We are such a superstitious country anyway. But the case that can really be made is - it was a media creation in the Victorian period. It became famous after the Great Exhibition, it's an extraordinary story. LH:How did you get interested in this story? WD: I got interested when I was writing Return of the King. I had gone to Afghanistan - to Kandahar and Herat to gather information. I read about the Kohinoor (in the texts there). The Kohinoor was there around the time of Shah Shuja, his brother loses it, and the first thing he does when he comes to power is to search for it, and finds that the Kohinoor is being used as a paperweight by a mullah, and the Fakhraj ruby is found hidden under a rock. Then it was at the Jaipur session of JLF two years ago that I realised that Anita and (diplomat) Navtej Sarna had both written around it. When we went on the panel it was thrilling, when we came off stage we decided we must do a book. But then Navtej was made the high commissioner in London and he couldn't do it for political reasons. Anita and I carried on with the project. We consulted many of the great scholars on the subject, what we found was a consensus on a number of things - most importantly that there is no clear history before Nader Shah. It was after it became famous that people started reflecting on it - oh-it-must-be the Kohinoor. But it could have been the Darya-i-Noor. There were many, many big diamonds around. What we realised was that there was an extraordinary story to be told. LH:Why is it that no Indian historian has ever attempted to write about the Kohinoor? WD: (laughs) You have to ask them. This is an important issue in history and I will argue it is a central part of India's history. But I am glad we have been able to put together this research. LH:I love the way the book is structured. WD: It reads like the Game of Thrones (laughs). LH:How difficult was it to research the book as the only available version was of Theo Metcalfe's which you say was more like the 'Delhi Bazaaar gossip'? WD: There is no reference to anything called the Kohinoor before 1751 when Mohammed Marvi sitting in Herat says 'I have seen the peacock throne and the it sits in the head of the throne'. That is the first solid reference. The rest of the references are mined in antiquity, eye of a god in some temple, captured by the plundering Lodhis, passed to the Tughlaqs, passed to the Mughals - it is basically a mythology. There is no evidence to that. It may be the case, it may not be the case. LH:Is this your most difficult book to date then? WD: It wasn't difficult to research. It is a concentrated subject. I am currently working on a book on the East India Company, which is a vast subject. That is difficult, just by the sheer amount of paperwork it is generating. This is a neat little story. It didn't take very long to talk to the experts on this - four-five across the globe. The experts more or less said the same thing that were was no evidence of Kohinoor before Nadir Shah. I had a real breakthrough when I learnt about Marvi's reference (when in Afghanistan). After that the mention of Kohinoor keeps popping up with regularity, and once it gets into Ranjeet Singh's hands everyone writes about it. And then from the time it is taken by Dalhousie and handed over to the Queen it (history) is quite clear. LH:So the diamond on display in the Tower of London is indeed the Kohinoor? LH:Why is India interested in reclaiming it? And because the Kohinoor arrived in England just immediately before the Great Exhibition. It arrives in England in 1850 and goes straight to the exhibition and thereafter it is the diamond, the supreme diamond, by dent of its own mythology. What we are doing in this book is scrape away the encrustation of mythology - which is a lot. Therefore, it is likely it was there in the peacock throne when it was made for Shah Jahan, but before that - we can say nothing at all. LH:What should be India's ground for reclaiming the Kohinoor - legal or moral? WD: There is no question that the Kohinoor originated in India. All diamonds did come from India till the discovery of the Brazil mines in 1725. It is unlikely to be a new world diamond. There is 99 percent chance that it came from an Indian source, more likely its a Golconda diamond from southern India. Because they are crystalised it is impossible to trace their date. Diamonds are not like trees that you can carbon date, you cannot tell the age of a diamond by looking at it. I think you can tell a South African diamond from a Brazilian diamond or from an Indian diamond if you look at the gemological structure, but beyond that there is nothing much you can study. LH:Should we then reclaim it? WD: That has to come from India. That said, there are many other items of colonial loot. For example Bahadur Shah's Zafar crown which is in Windsor, taken by force, in 1857 from the Red Fort. LH:Is the Kohinoor then the most famous and most important diamond in the world? WD: Yes, absolutely. But it is not the biggest.